it can be applied to any trading strategy. 2. Where is it coming from, where is it going. Question: PB (Pin Bar) is a Direction Bar, OB is a Direction Indicator, but IB is not? is there a way to decide the most probable direction breakout of an IB? How is it done? Answer: the IB must have its high/low/open/close near each other. 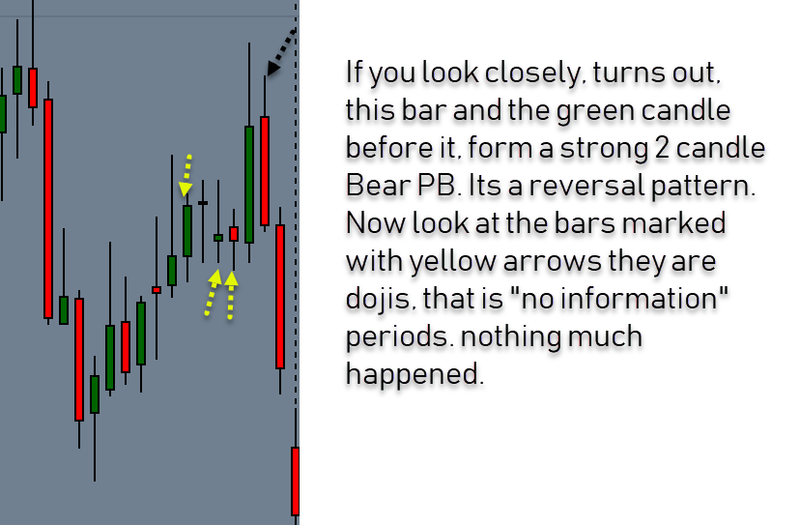 if Yes, the directional breakout probability will depend on the bar to left. If its a strong Bull Bar, higher chances that the IB will breakout UP. Also something to remind ourselves about is that an IB is not an IB if it has a good Healthy RANGE. e.g. if its normal for a market to have 50 pips daily range. and you see an IB that has 40 Range it's not really telling us anything, in that case the direction of the IB will have information. a bear or a bull IB. 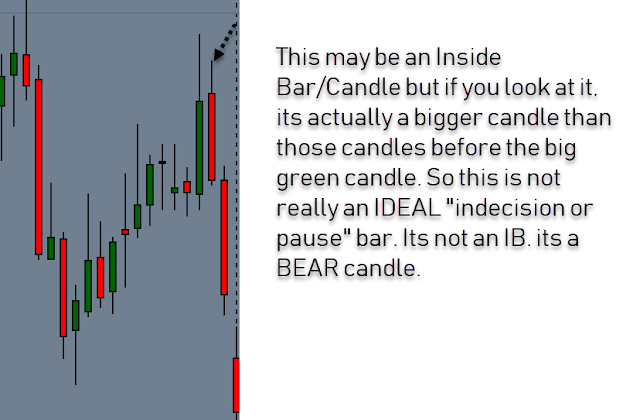 Is this a Bear candle or an IB? as @Snorm mentioned the other day. Not only can it be different per time frame it can differ per your METHOD of establishing the trend. e..g a trend can be based on AIMS Gator, it can be price above or below the Purple trend, or any other means used, and all could lead to different trend indication. Some people would define it with moving averages, other using swings on price charts, yet other using elliott wave. Some AIMSters use AIMS Box only. 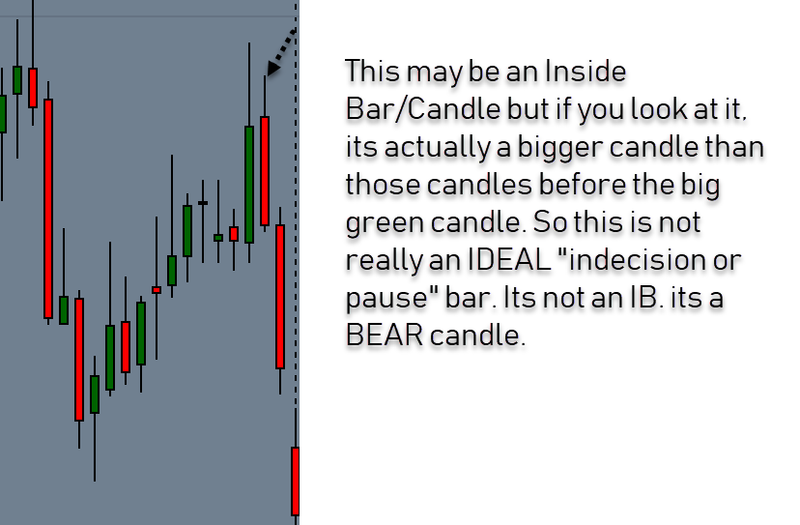 But the WiPG method of @Jasmien, looks at 1-2 candle patterns. The method is based on our knowledge of trading patterns that we identified using indicators on several different time frames and markets. The patterns that gave us statistical advantage and high confidence. It involved years of studies. It created a fractal geometric pattern has lead to this 2 candle formation. Its highly probable and less time consuming. Hey Merry, Thank you for your comment and kind words. Much appreciated. I'm glad that you've found value in this way of trading and have benefitted.